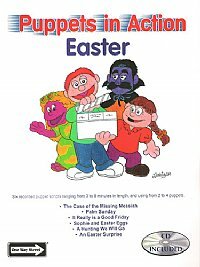 Puppets In Action Easter CD/script book has six recorded skits and are three to eight minutes in length and use two to four characters. There will be musical interludes and sound effects with each play. Each one has a gospel message or tie with the Biblical story of Easter. Great for Children's Church, Sunday school, at outreach programs or along with several songs to build into a longer program if needed.